Of my memories of my two grandmothers, both now long since passed, many are of their food. They were both Italian and both only a few generations removed from southern Italy, but they cooked two distinct sets of recipes. Even their meatballs and gravy were entirely different from each other. My paternal grandmother made the best minestra maritata – or, “Italian Wedding Soup” – I’ve had in my life, to this day. My maternal grandmother made potato gnocchi from scratch – springy, substantial gnocchi the likes of which I’ve never since tasted again. Some members of my father’s family can duplicate the Italian Wedding Soup, but my mother and I cannot recreate those gnocchis. We’ve both tried. Despite making them many times with my grandmother, I couldn’t possibly tell you the recipe. There wasn’t one. She eyeballed the ingredients every time, combining them by hand right on her kitchen counter, cracking the eggs into a mound of flour. She could never settle on the most efficient process to cut and “thumb” them – that is, put the little divot in the middle. She alternated between a butter spreader, a pizza cutter, and her bare hands, never satisfied with any of the methods. There is one recipe of my maternal grandmother’s I can make. “Scapels,” she called them, a sort of plain, egg crepe rolled up like cigars with sharp grated cheese inside and served under scalding hot soup. I only know how to make them because she could not eyeball the ratios of ingredients in the batter. My grandmother grew up during the Great Depression and barely had a grade school education. She wasn’t confident writing more than a few words in longhand and couldn’t easily multiply entire lists of ingredients. “Three to one to one,” I would reply, exasperated, probably interrupted from reading a book. 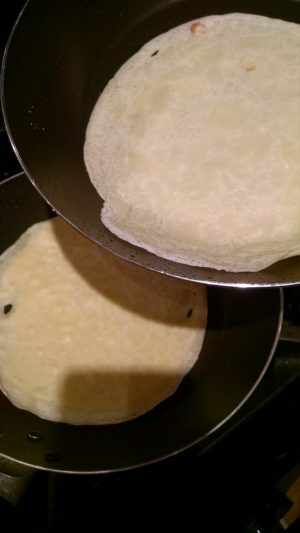 The recipe for her scapels is dead simple – 3 parts eggs to 1 part each flour and water, plus some salt, pepper, and parsley, and rolled up with Pecorino Romano cheese.